Ocean Sparkle lives up to its responsibility and commitment to ascertain healthy and safe working conditions for all personnel engaged in our operations. We always try to limit our impact on the environment and are committed to deliver high quality services on time. It is the company’s goal to ensure safety in ships operations, to ensure the safety of the crew and to avoid damage to property and the environment. All the vessels owned and managed by OSL are operated in such a way as to minimize Health and Safety risks of the crew and to protect the environment in accordance with international conventions, and national and state regulations. Our quality management system is set up to comply with the requirements of the international standards for quality assurance, health and safety, and environmental aspects and impacts including pollution control. Ocean Sparkle is dedicated to deliver second to none service with highest quality standards to our customers. We have received major certifications for our world-class quality management systems. 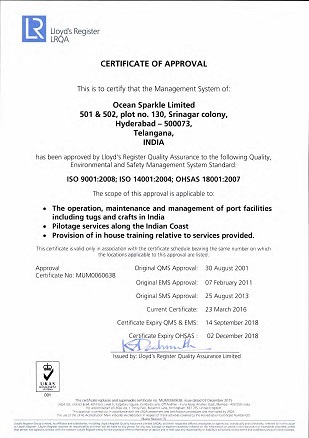 Ocean Sparkle Limited is also awarded with a “Document of Compliance” by the Director General of Shipping under rule 5(1) and the provisions of the International Convention for the Safety of Life at Sea, 1974, (SOLAS), for the safety management system of ‘Other Cargo Vessels’ and with “Safety Management Certificates” for the ships that are under its purview in accordance with the requirements of the International Management Code for the Safe Operation of Ships and for Pollution Prevention (International Safety Management: ISM Code). Ocean Sparkle Ltd is a professionally managed Company. Majority of the Board of Directors are Independent Directors, highly qualified and experienced professionals with highest integrity and reputation. The Company follows utmost transparency on various facets of importance to the stakeholders, particularly with regard to information relating to financial matters and corporate governance in its Annual reports, and any other communications.